There’s booze! Wine! Beer! Sake! Sticky Rice has opened another location and it’s in Echo Park in the old Xoia space. I checked it on its second night open and really love the space. All the tables and chairs were made by partner Bryan Sharafkhan-Sharp who also runs the White Guy Pad Thai truck (aka Sticky Rice on Wheels). This location has beer, wine and sake. 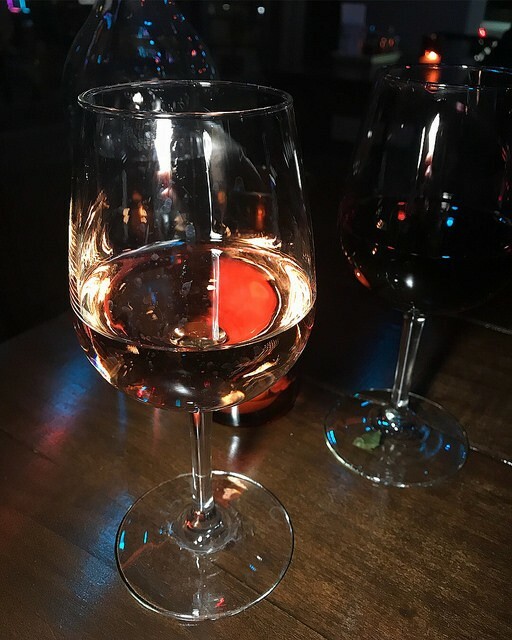 We opted for rose wine and red wine this night. 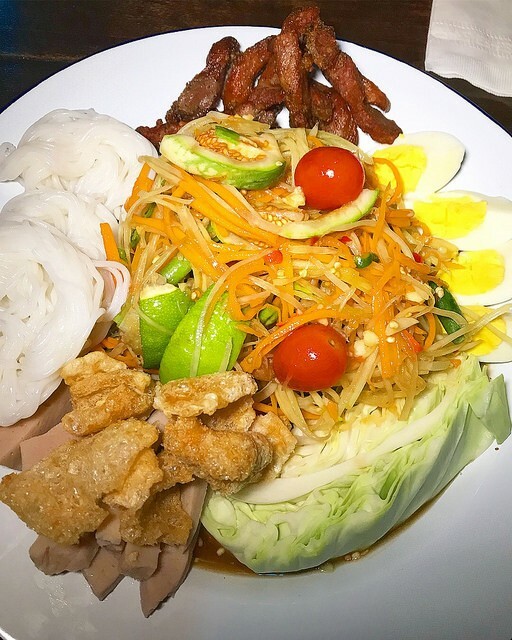 Under the specialties, you might miss the tum tad which is the best way to get lots of different appetizers including papaya salad, pork jerky, rice noodles and more. We had so much fun eating this. The papaya salad is proper Thai spicy so make sure to avail yourself to the provided cabbage or noodles to tame the spice. 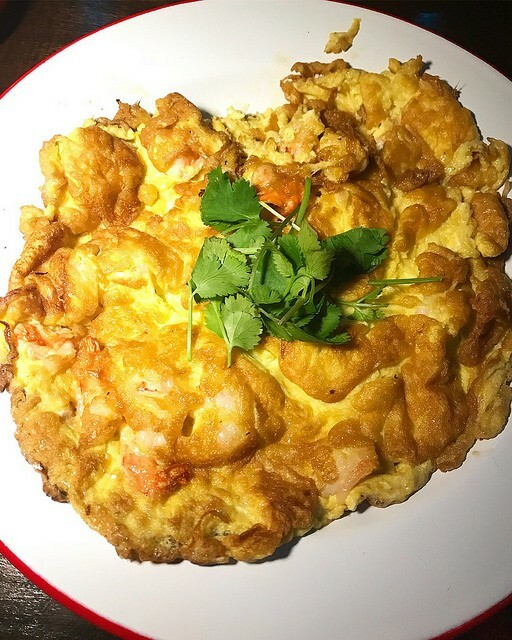 One of my favorite Thai dishes is the simple omelet which I like with rice. I wanted crab but they were out so we got this with shrimp. Owner Dave Tewasart recommends eating this with sriracha. 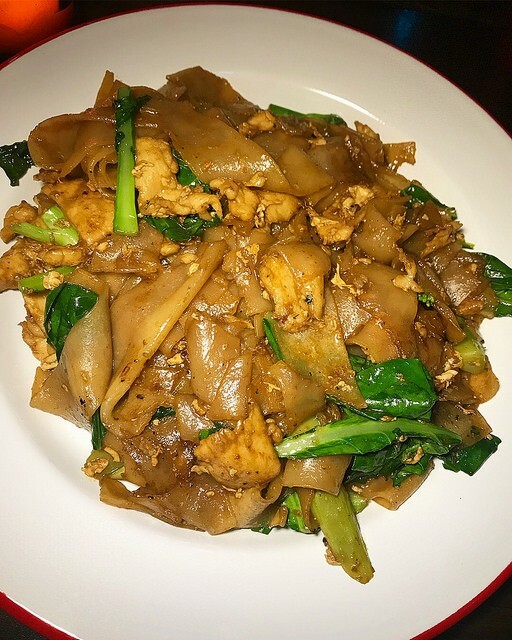 There were only two of us so we couldn’t order everything we wanted but a good stand dish is the pad see ew. We got this with chicken which was very tender. And I liked the contrast of the crunchy greens. This Sticky Rice has much more extensive menu than the original location in Downtown Los Angeles at Grand Central Market. However, it feels there are even more dishes than sister restaurant, So Long, Hi. Keep an eye out on this location. There’ll be karaoke eventually!